Happy Halloween! Errrrr, in a few days! I made you spooky, creepy black macarons. And then I ate them all up before it was Halloween and had to make more. Repeat times 3. I used my basic French macaron recipe for the shells. I made the recipe years ago, and I keep coming back to it. I also made a chocolate macaron version, because life is not complete without a chocolate version. I even altered the recipe to make salted caramel macarons, and put it in my cookbook. It’s just a solid recipe. I originally thought it would be hard to scale down such a finnicky French recipe, but as it turns out, the recipe is usually based on weight, which is much, much easier to scale down. See also: easy to scale up. I don’t pray to the macaron gods before making these tiny, chewy little cookies, though I do take a bit of help. I use a mixture of egg whites and powdered meringue. You can find the powdered meringue at the craft or hobby store (don’t forget your coupon!). I love it because it basically makes the recipe fail-proof, and plus, it has a hint of vanilla that flavors the macarons so nicely. Plus, it just smells so good. Sometimes, I open the powdered meringue jar in my pantry and take a sniff. This is my life. In the many iterations of these cookies that I made, I once played around with anise extract and made them licorice flavored. I completely loved it, though licorice makes most people run for the hills. I even shared homemade black licorice on this site before, and the Facebook response was um, not nice. Can we still be friends over red licorice? 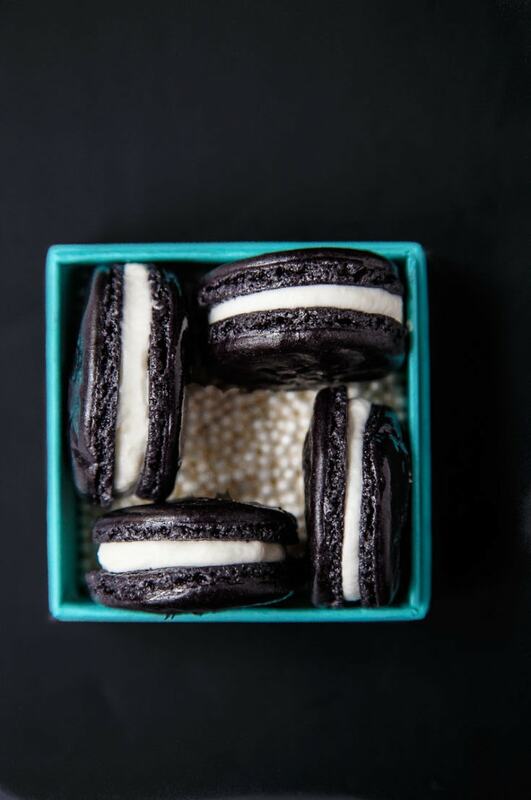 So, make these vanilla-flavored, make them licorice-flavored, whatever you fancy. Oh, one final note: I used whipped cream as the filling instead of the usual buttercream. I love the airy, lightness of macarons, and have always felt that buttercream weighs them down. Happy Halloween, friends! Be safe! Definitely don’t dress your 6-month old daughter up like a cat and take a million photos, ok? Cuz that’d be copying me. Line a small half-sheet pan with parchment paper. Make sure the parchment paper fits the pan exactly, as any excess paper will buckle and make the macarons spread unevenly. In a small bowl, sift together almond meal and powdered sugar. You may have a few teaspoons of almond skin that won't go through the seive--toss it. Once the meringue has soft floppy peaks, stop beating. Then, in 3 increments, add in the the almond meal and powdered sugar. Gently fold it in using a spatula (scrape down the middle and sweep the sides carefully). Add the extract of your choice. Once everything is well incorporated, scoop the mixture into a plastic bag or pastry bag. This is easier if the bag is inside a tall glass. Squeeze the mixture down to one side and snip the corner off of the bag. Let the cookies sit at room temperature for 30-60 minutes before baking. Before the cookies go into the oven, they should appear dry. This takes longer on humid days. While waiting, preheat the oven to 300Â°. Bake the cookies in the middle rack of the oven for 14-16 minutes. They are done when the tops are dry and they have risen up to reveal their â??feet.â?? Let cool on the baking sheet, then carefully peel them off the parchment paper, and move them to a rack. Meanwhile, whip the heavy cream and powdered sugar to make the filling. Dot it on 6 of the macarons, and top with the remaining cookies to make sandwiches. *I used food coloring gel, not the liquid. It's much more intense than liquid food colors, and that's a good thing when it comes to macarons--you don't want to add too many extraneous things to the batter for fear it might break. As always, check out my recipe index to use the leftover egg yolks from making this recipe. 1. I need cat picture. like STAT. 2. I also need spooky macarons double STAT. I have a confession: I’ve NEVER had a macaron. I know, i live under a rock. BUT, I must start with these! Love the Halloween vibes girl! I love the idea of whipped cream vs buttercream! Such a good idea! These look like such a good grown up Halloween treat! 1. I agree with Taylor – we need photos of that kitten! 2. I just got both of your cookbooks during our recent USA holiday and I think I’ve flagged every single recipe! 3. 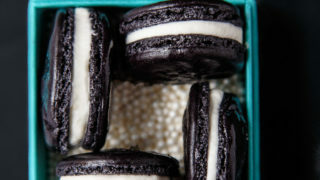 I love these black macarons and the fact that the recipe makes just enough for me to jam in my mouth :) I’m not sharing. 4. I LOVE BLACK LICORICE! I am going to give your recipe a try – STAT! My family is Danish and red ‘licorice’ is not licorice at all! It’s coloured candy. Real licorice is aniseed filled and preferably salty! how cool!! 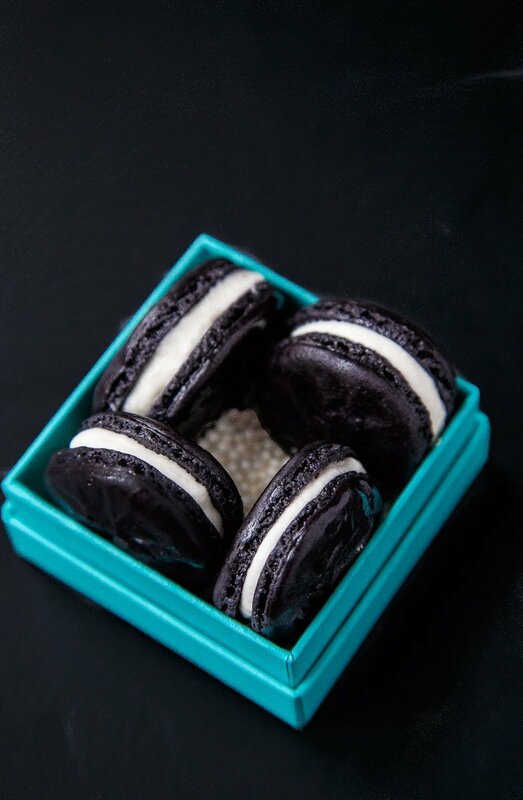 I love the inky black color of these macarons! Super creepy! These look absolutely tasty. Yum! That’s sooo cute that you’re dressing up your daughter as a cat! Hope you take a ton of photos! I’ll have to try that meringue powder trick! I have yet to make a successful batch of macarons! These look great, and not intimidating! When you say older egg white, what does that mean?? Thank you! Macarons are literally my favorite cookie on the planet, and the two places I love most in KC that make them, WENT OUT OF BUSINESS. Saying I’m upset is a severe understatement. I’ve been meaning to try and make them at home, and you make them sound so easy…..It needs to happen! Add a touch more….that has more to do with your gel than the recipe. Hahaha. What is ? cup ?